CHROMOSOMES, as the physical carriers of heredity, have already been considered. And before their discovery two other laws of heredity had been found that need mention. One is Galton’s Law, purporting to show that ½ the qualities of an individual are derived from its parents, ¼ from its grandparents, 1/8 from its great grandparents, etc. The other is Mendel’s Law, indicating how inherited characters are distributed, and that the fundamental cause of this distribution lies in the germ plasm. This law was worked out by Mendel on peas, and later by others on rabbits, guinea pigs, fowls, beetles, and silkworms. 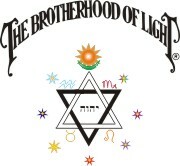 It shows that inheritance is through unit characters—which has now been verified by a study of genes (Chapter 4, Serial Lesson 167, Course XVII, Cosmic Alchemy)—and that while it cannot be predicted what proportion of white and black will appear in succeeding generations from mating white and black individuals, yet once the proportion is known, it may be used with certainty as the basis of future production. Thus if in mating a white and a black ¼ of the offspring are found to be white and ¾ black, it may confidently be expected that again in mating white and black of the same species the same proportion of white and black will appear in the offspring. But in order for a new species to be formed it is necessary that some of the offspring show marked tendencies that neither of their parents had. The mechanics of these sudden appearances, called mutations, has been explained in previous chapters. It is enough here to point out that whatever change of structure or functions such a mutation possesses is handed down to its progeny through the indicated laws of heredity. Natural selection, which was given detailed study by Darwin, is based upon the principle that those creatures that are somewhat better fitted to live in a certain environment survive, and those less fitted perish. Furthermore, for the same reason, an organ or a function that gives an individual an advantage, and therefore makes him more able to survive than his fellows who do not possess the organ or function, is preserved and passed on to his offspring. The offspring, then, by virtue of their superior adaptability, live and propagate, while less fortunate forms of life that compete with them for food and life become extinct. Due to the prolific tendencies of nearly all life forms, there is available space and food on earth for only a very small proportion of those that are born. As a consequence of the limited area and limited food supply, there is a bitter competition between the limitless forms for possession of this space and food. At the date of this writing (1949), for instance, Milton S. Eisenhower, president of Kansas State College, states that only 11 percent of the world’s land can be used for food production—a total of 4,000,000,000 acres. As there are about two-and-a-quarter-billion people now living, this means there is less than two acres available for each. Yet it takes not less than two-and-a-half acres to raise enough food for one person. Eisenhower makes the flat statement that today more than two thirds of the people of the world do not get enough to eat. But considering physical life as a whole, the competition for space and food is in three different directions: First there is the struggle between different species. Of two species deriving their food supply from the same source, or occupying the same territory, the one most suited to that particular environment will survive and leave offspring, and the other will perish. This principle is well exemplified in the struggle between sheep and cattle in the western United States. Cattle once throve in vast number on the broad western ranges. There was plenty of food, and they multiplied rapidly. Then came the sheep. These could bite the grass clean to the roots, as well as live on brush and other unpalatable fare. They also left an odor where they passed that is disgusting to other herbivorous animals. Thus the cattle were forced out, for they cannot live where sheep thrive. The owners of the cattle and the owners of the sheep then took up the struggle. The cattlemen, for a time, were greater in number and were skilled in the use of firearms. They realized that cattle could not compete with sheep, and made the issue in several sections of the West a war between cattle men and sheep men. This struggle later was carried to the courts, and finally to the legislature. Sometimes the victory has been with one and sometimes with the other, but the struggle is due to the fact that sheep have developed more ability than cattle to survive when there is keen competition for food. Next, there is keen competition between the individuals of a single species. This is inevitable, because the rapid rate of multiplication, if unchecked, soon fills all available space and becomes greater than the food supply. Our two worst pests—because they carry deadly bacteria and deadly protozoa to the human race—the housefly and the brown rat, for instance, multiply at an enormous rate. It has been calculated that the offspring of a single pair of houseflies, if they all lived and reproduced and these lived and reproduced, would in a season be so numerous that their mass would be larger than the whole earth. The offspring of a single pair of brown rats, if all reproduced and none died, in a single year would number one million. It will be seen that at such a rate of multiplication there soon would be no food left, even though flies and rats had no other competing species to reduce their food supply. 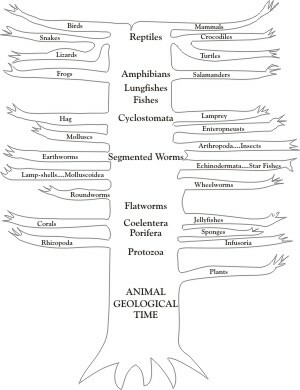 We also see this competition between members of the same species in the circle of our human acquaintances. There is a struggle for money, for honors, and for special privileges. Some have millions of dollars and some have none, nor can find opportunity to earn their daily bread. We call ours a civilization, but surely it is not that so long as it deprives a single willing person of the opportunity to work for enough food to live. War, too, a barbarous ancient institution, is the direct result of this competition between individuals who have grouped together for mutual advantage. But the problem of the individual’s food supply and the problem of war cannot be solved by any amount of sentimentality. They can only be solved by a discriminating use of carefully collected biological and sociological facts. The third form of competition, about which considerable will be said later, is the struggle of both individuals and species with the forces of nature. Changes of temperature, in the amount of moisture, storms, and changes in elevation and amount of land areas, all require fresh adjustments of organisms living in a region where such changes take place. The struggle to meet the conditions imposed by environment results in a constant shifting of living things, only those surviving that are peculiarly adapted to the conditions that obtain. Not only was natural selection given detailed study by Darwin, but Lamark gave detailed study to adaptation, and de Vries brought to scientific attention the significance of mutations in making successful adaptations which would be retained, through inheritance, by subsequent generations. Before the significance of mutations was understood it was held that those individuals who developed characters that were slightly advantageous in competition with their associates lived and produced offspring, and that those less well adapted died before reproducing. But there are innumerable developments in life forms that would produce very slight advantage until the new and highly complex structure was fully present. The simple sensitivity to light of the outer covering of a primitive creature, and this covering, or a section of it gradually growing more and more sensitive with succeeding generations, can hardly explain the development of an eye. The eye could only help markedly in adaptation and survival after it had been fully constructed, and after it had been linked by nerve cells to a sensitive optical center in the brain. Any slow progress in the simultaneous development of these various factors would not have been of much assistance in the animal’s struggle for adaptation and survival. Nature employs both inner-plane weather and outer-plane weather to prevent life forms from stagnating. Climatic changes compel creatures to change their structure or their habits, or both, or perish. And the record of the rocks prove that the soul activating life forms has the ability thus to bring about the necessary changes. Using psychokinetic power it moves first in one direction and then in another until it finds the correct answer to its problem, even though the answer be highly complex. Nor is the compulsion to make progress or suffer confined to creatures lower in the scale than individual man. Due to inner-plane laws, each person has his own inner-plane weather. It is mapped by his progressed aspects. At times this inner-plane weather is favorable, and at other times it is severe. Under progressed squares, semisquares, sesquisquares and oppositions, both the mental outlook and the outer-plane conditions change. Difficulties enter the life that require the utmost effort to surmount. The changing inner-plane weather insures that the individual will be confronted with one problem after another. If he is to live as he desires, he must find ways of solving these problems. He must develop initiative, intelligence and ingenuity or severely suffer. The Super Intelligence that permeates all nature, and whose mind has formulated the overall pattern of the universe, has wisely provided that nothing shall stagnate. Even the hardest rocks in time disintegrate. The only changeless thing we observe is change itself. Within this overall pattern there seems to be opportunity for souls to exercise freedom of choice. They can choose this road or that road, but if the form they occupy strays too far from the broad highway which leads toward the development of those qualities which will be of assistance in realizing God’s Great Evolutionary Plan, that form perishes and becomes extinct. 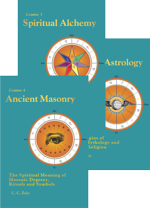 To develop those qualities of character, and those natural aptitudes, which eventually will be of assistance in realizing the cosmic plan, it is necessary that the soul which is being trained to become a useful workman in this vast constructive enterprise should undergo the kind of experiences that will provide that training. Other life forms or men only learn to overcome obstacles, which alone constitutes accomplishment, through encountering obstacles. Each obstacle surmounted adds to the ability to overcome other obstacles in the future. Only through overcoming smaller difficulties does the soul develop the ability to overcome larger difficulties. The Universal Intelligence has thus provided the necessary obstacles, but not in some whimsical manner, and not as if actuated by human favoritism or prejudice, but chiefly through the inner-plane weather and the outer-plane weather. As we shall see, life forms on earth from time to time had to struggle and make new adaptations to meet the environmental conditions brought through a change of outer-plane weather. 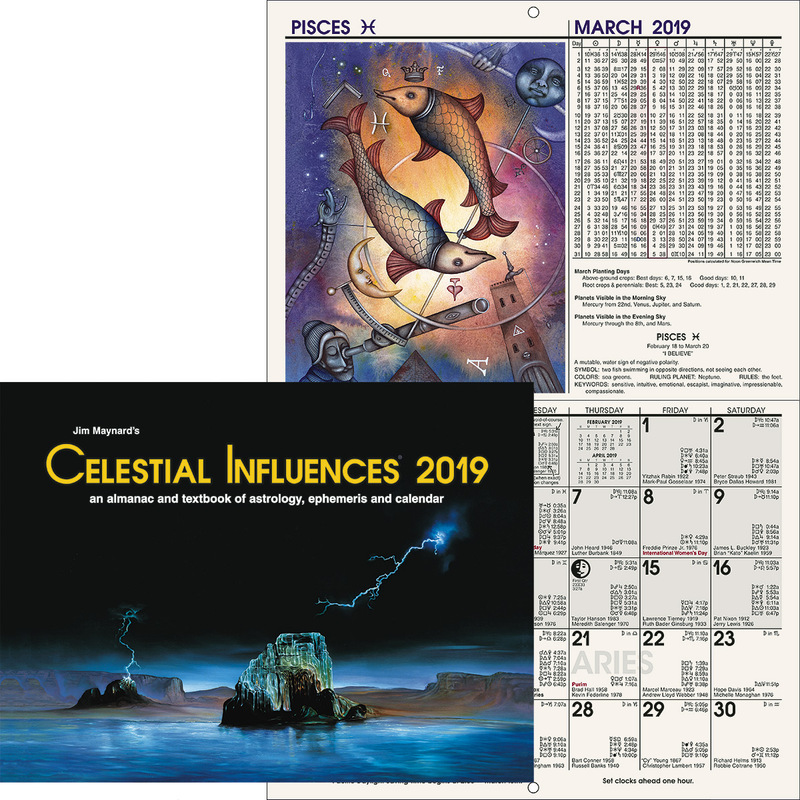 And not only is outer-plane weather—as a study and application of Course XV, Weather Predicting, demonstrates—influenced markedly by the inner-plane weather, but through progressed aspects the inner-plane weather markedly influences the individual. The inner-plane weather mapped by progressed aspects brings periods which are lush and easy, alternating with periods in which the individual is called upon to exert himself to the utmost to handle new and adverse conditions. And it is through learning how to overcome the difficulties which thus are periodically presented that the talents of the individual are developed and he makes progress in character. But in addition to bringing to each soul just the kind of conditions which it most needs to develop the qualities it should gain eventually to fill its particular job as a workman in God’s Great Evolutionary Plan, this inner-plane weather has held the progress of life within certain broad boundaries. Life forms that have strayed too far from the broad highway that leads to the development of a form which in itself is a microcosm, or miniature universe, have one after another become extinct. The inner-plane and outer-plane weather have made it possible only for those forms to continue their progress which have led in the general direction of developing the form of man. Man, as a universe in miniature, is the climax of physical form and function. But he is not the climax of evolution; for by developed self consciousness he has become fitted to continue the evolutionary process indefinitely after physical life amid the far more advantageous surroundings of the inner plane. Progress had been such that by the Devonian period of the Paleozoic era there were not only land plants, but flowering plants, and not only land insects but vertebrate land creatures. These laid their eggs in the water and went through the early stages of their lives in the water. The earliest record of such an amphibian is the track of Thinopis antiquitus, found in 1896 by the late Professor Beecher of Yale, and presented by him to the museum. The two periods following the Devonian frequently are considered together as the Carboniferous period, which commenced with the Mississippian period about 300 million years ago. They are so grouped because both favored vast and luxuriant vegetable growths. In the Mississippian, or Lower Carboniferous period, the climate changed from the more severe Devonian, becoming mild and moist and highly favorable for the growth of rank club mosses in the low-lying swamps. The dominant life at that time were the sharks. They not only were abundant, but grew to immense size. Chiefly they were of the ancient type that fed on shellfish and later became practically extinct. The vegetation of this period in time became coal, and while the first record of an amphibian goes back to the Devonian, the first fossil bones of amphibians were found in the Edinburgh Coal Measures in Scotland which belong to the Mississippian period. The sixth period of the Paleozoic era, the Pennsylvanian, or Upper Carboniferous period, began about 255 million years ago. Seed bearing shrubs and trees of many species are known to have existed at that time, but their flowers were small and inconspicuous. The mild climate continued, and throughout the swamps the coal plants reached their greatest size. These plants, largely club mosses, were of soft, spongy wood and made rapid growth. They propagated by means of spores, which were carried by the wind, giving a uniform character to the forests all over the world. These coal swamps formed a suitable environment for spiders, scorpions, centipedes, ancient insects, snails and amphibians. Early in the period insects grew to enormous size. There are fossil cockroaches as long as one’s finger, and dragon flies with a 29-inch wing spread. None of these insects, however, had voices, or were much specialized in any direction. The climate and the plants were of a monotonous sameness, and the insects needed little complexity to meet such conditions. At the end of this period, as the climate became more arid, the reptiles developed from the amphibians, as there is direct evidence to show. This was the time in which the great coal deposits were formed through the burial of great masses of swamp vegetation. It is also the period in which the earliest fossil remains of true reptiles have been found. Once more let us return to the amphibians. As previously mentioned, they must spend the early days of their lives in the water. In this early stage they have gills like fish for breathing in the water, and must secure their food supply there. They are thus well fitted for a climate in which at certain times of the year there are heavy rains that fill the rivers and pools, and at other times of the year there is an arid condition in which the rivers and pools dry up. After their early growth they can live the balance of their lives on the land. Now toward the end of the Pennsylvanian period climatic conditions in certain sections grew increasingly arid. The pools and rivers not only dried up for part of the year, but it gradually came about in certain regions that they remained dry the year round. Creatures that must lay their eggs and live their early days in the water could find no suitable habitat. The soul struggling for life and expression was hard put to find some way of meeting and adapting its physical organism to this new situation. Probably innumerable amphibians, trying first this and then that failed. But finally extrasensory perception was able to guide the psychokinetic power in at least one female amphibian to a successful solution of the problem, and she handed on the knack she had acquired to her progeny. The solution took the form of making a more suitable egg. Additional yolk was supplied to the egg, so that the young might have an ample food supply to nourish it beyond the larval stage and the metamorphosis in which it transforms from a tadpole with gills into an air breathing animal. Henceforth this transformation, which previously had taken place in the water, would take place in the egg before hatching, as it does in the embryo of all higher animals, including man. And to protect the egg better from the inclemencies of the weather, and from drying out, it was provided with a covering, or shell. The gills were lost forever, in so far as the hatched animal is concerned, and no longer did it need to have water in which to lay its eggs. They could be laid in the dry sand and hatched by the sun. Thus the true reptile was developed, many species of which no doubt were adapted to the desert, as they are today, where they live and thrive far from any pond or stream or spring of water. During the Paleozoic era fish were dominant. Its seventh and last period is the Permian period which began about 215 million years ago. It was marked by a drastic change in climate. The land which had risen somewhat toward the close of the Pennsylvanian period continued to rise, so that after the arid condition at the commencement of the period, which was drastic in its way, there followed quickly a glacial age even more rigorous in its cold than the one so recently passed, which was successfully weathered by man. The higher mountains become, the colder the atmosphere. This is the time of the Appalachian Revolution, in which great mountain chains were forced up in the eastern section of the United States. The ice age of early Permian times, however, started in the Southern Hemisphere. But from there it spread over much of the world. These harsh conditions destroyed the old forms of plant life, that were ill adapted to the cold, and developed hardier stock. The new plants, starting in the Southern Hemisphere because the cold became severe there first, spread northward. They consisted of cycads, ginkgoes, modern ferns, and conifer trees. These became the dominant plants during the Age of Reptiles which was to follow. This cold period destroyed many of the invertebrate animals, and they became extinct. Those that did survive have changed little up to the present. It was due to these severe winters that the insects, in order to weather the cold and live through a long period in which there was no food, devised the method by which the larva encases itself in a cocoon, in which it lies dormant throughout the winter, to awaken when the weather becomes warm and emerge transformed from a crawling caterpillar into a mature insect with wings. Insects previous to the Permian period did not undergo this important change. They were compelled to devise some way to endure the long cold seasons of early Permian times, and met the situation in this way. Just how much intelligence does the extrasensory capacity of an insect have? That is a hard one to answer. But here is an example of the exercise of that intelligence which takes place each year in the mountains near Los Angeles. The southern slopes of these mountains in early summer are spectacular with the tall candle-like stalks of Yucca plants white with bloom. They belong to the lily family, but depend for pollination on one particular insect, the Yucca Moth. This moth flies by night to a Yucca flower, collects the pollen from its stamens, and kneads this into a little ball which she tucks under her chin. Then she flies to an older Yucca flower and lays her eggs in some of the ovules in the seed box, being careful to leave plenty of ovules free from eggs so that they will mature into seeds and insure future plantings. Finally she applies the pollen from the little ball she carries to the tip of the pistil, thus insuring that the flower shall be fertilized and that the seeds, upon which her race depends, shall grow. Her larvae, when they hatch, live on the Yucca seeds. She thus provides for the continuation of her race; for Yuccas do not bear seeds in regions where there are no Yucca Moths. Reptiles first appeared on earth during Pennsylvanian times, developing rapidly and specializing in many different directions during the period of aridity and cold of the Permian. In the layers of rock formed from the mud and sand laid down in the Permian period the presence of not less than five out of the total fifteen orders of reptiles have been discovered; and there is much indirect evidence that six or seven other orders were then present, such as the turtles, beaked lizards, and crocodiles. Then came a new geologic era, the Mesozoic, which means the age of medieval life. It began about 190 million years ago and is often called the Age of Reptiles, because while both mammals and birds put in an appearance rather early in this era, they were not able to compete with the reptiles but were forced to live inconspicuously. The era is divided into four periods of unequal duration. The first period of this Mesozoic era was the Triassic period. In the Permian period there were reptiles called cotylosaurs, and from these developed protosaurs. Then in the Triassic period from the protosaurs developed the parasuchia, and finally as modifications of these came the dinosaurs, meaning terrible lizards. They soon grew to be the most formidable and the largest land animals the world has ever known. Their remains are first found in Middle Triassic formation, representing a time some 175 million years ago. There were other kinds of reptiles during the Mesozoic era, but the dinosaurs dominated all four periods. The imprints of their feet are to be found in the rocks of Colorado, Arizona, Utah and Wyoming as clearly as if they had walked over the muddy ground only yesterday. Some footprints are as much as fifty-two inches long. But all became extinct at the close of Mesozoic times. They were giants, and some were terrible. But as colossal as they were, weighing up to eighty tons, they had minute brains and like that of modern reptiles, their blood followed the temperatures of their environment. The Age of Reptiles, as the whole of the Mesozoic era is called, was a period of calm lasting perhaps 135 million years. To be sure, land rose and fell in different places, and some of the land went beneath the sea and some of the sea floor became dry land. But it was nothing like the Carboniferous period, during which volcanic action was intense and the atmosphere was humid and stifling, storms were almost constant, rain came down in torrents, and the sun was seldom seen because of the heavy clouds. Nor was it like the drastic cold of the Permian period. The reptiles, including the dinosaurs, were able to meet the problems of the more placid Mesozoic era with amazing success. The first marked progress of the dinosaurs was probably hastened by a semi arid climate which compelled them to travel long distances for food and water. After they first became established, the climate underwent various changes and in response to these changes some of them developed new forms and new habits. In fact, their habits were quite as varied as those of the mammals at the present time. Some of them were no larger than a house cat, but some, like Brachiosaurus, reached a length in excess of 80 feet. Some fed upon vegetation; but some were carnivorous, preying upon the herb eaters. Practically the complete skeleton of one of the carnivorous kinds, Allosaurus, measuring 34 feet 2 inches in length, by 8 feet 3 inches high, was unearthed from Como Bluff, near Medicine Bow, Wyoming, and is now mounted and on exhibit in the American Museum of Natural History, New York City. The largest of the carnivorous species so far found is Tyrannosaurus Rex. It is 47 feet long and must have weighed as much as the largest living elephant. It stood 18 to 20 feet high, and the hind limbs, which is as common among them supported the weight of the body, were larger than an elephant’s. The great jaws were set with teeth an inch wide and from three to six inches long, and the feet were armed with great sharp curved claws. Being so large it could hardly move with great speed, and probably preyed upon the huge herb eating armored dinosaurs that lived at the same time. These had developed an armor of hard scales, and had horns with which to defend themselves. There were also smaller carnivorous kinds, such as Ornitholestes, which was unearthed from the famous Bone Cabin quarry in eastern Wyoming. It was only seven feet long, being slender and no heavier than a setter dog. In contrast with the bulky forms, it was fitted for great agility. A common feature of many dinosaurs is that they walked on their hind legs and used their heavy tails as a balancing organ and auxiliary support when at rest. Brontosaurus, one of the herbivorous species, is now mounted in the American Museum of Natural History, measuring 66 feet 8 inches long, with a weight estimated at 38 tons. The oldest dinosaur relic is found in the rocks of Central Europe; but in a layer of rock almost as old, dinosaur remains have been found in North America. Scientists conclude from this that they probably had their origin in a land mass then existing between America and Europe, where later lay Atlantis. They spread to almost all parts of the world, being found in Southern Asia, Africa, and Australia. What is now Connecticut Valley, late in the Triassic period was an arid region, like that now of the Southwestern United States. The plant life there was rushes, pines and ferns, with no sign of flowering plants. There were dry stream beds that occasionally became flooded with water; and extending down the valley was an estuary. In the mud about this body of water walked numberless dinosaurs, 150 species having been counted. These footprints, some of which became uncovered, were first observed in 1802, but were thought to be those of birds. Their true nature was discovered in 1835. The mud had changed to brownstone, and a slab containing important records was for 60 years used as a flagstone with its reading matter turned down. This brownstone slab is now at Amherst College, and other slabs have revealed the presence of the 150 different species of dinosaurs mentioned. For a long time it was a disputed question whether dinosaurs laid eggs or gave birth to their young alive; certain living reptiles following one method and certain other ones the other. The question was definitely settled by the American Expedition to the Gobi Desert in Mongolia where, in 1923, it unearthed 25 fossil eggs belonging to several species of dinosaurs. In several of these, which had been broken, could be discerned the delicate bone of the embryonic dinosaur. Furthermore, it was discovered that these giant reptiles had gizzards for grinding food, linking them more closely to the birds than hitherto had been possible. These eggs were laid during the Cretaceous period, about 50 million years ago. Returning now to the Triassic period, in the upper layers of rock that were laid down at this time are found the fossil remains of the flying reptile, the Pterodactyl. Up to the present time the intermediate stages have not been discovered as fossils, and like the turtles, the pterodactyls suddenly appear in the strata fully developed, making little improvement later. At the present time there is an amphibian, several species of which live in Borneo, which has developed the ability to volplane to considerable distance. It is a tree frog which has broadly webbed feet, and also webs in the angles of the arms that sustain it somewhat in the air, increasing the distance of its leap. There are also at the present day two kinds of lizards, or reptiles, that glide very well. One, the Draco, is a little lizard whose sides stick out into a pair of wing-like membranes supported by a number of long ribs. This apparatus folds like a parachute, anticipating the invention of man, and being used for much the same purpose. The flying reptiles of the Upper Triassic period are not thought to be direct ancestors of our birds, although there is considerable structural resemblance between them. But both flying reptiles and birds are thought to have developed from a common ancestor that lived in Permian times. Some of these flying reptiles—and they not merely soared but were capable of sustained flight—were no larger than a sparrow. 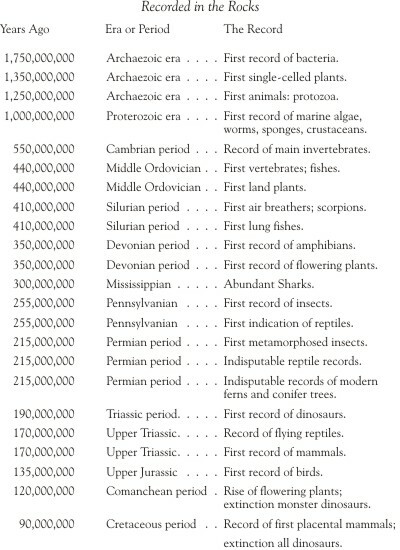 Other species were the largest creatures that ever flew. One from the rocks of the Cretaceous period, mounted at Yale, measures 18 feet wing expanse, and others are estimated to have had an expanse of 26 feet 9 inches. The best specimens come from the chalk beds of Kansas. This is not the first instance in the world’s history of an animal solving the problem of aviation, which only recently has been solved by man. The insects solved it first in the Paleozoic era, probably actuated by the necessity of escaping from the amphibians that fed upon them. But the wings of the insects, while serving the function of flight, are very dissimilar in principle to those of the flying reptiles, the birds, and the bats. An insect’s wing is merely an expanded and greatly modified section of the wall of its body. The wings of birds, bats, and the ancient flying reptiles, as well as those of flying fish, are modified front limbs. That flying fish use this ability to soar to escape enemies—sailing above the water by means of large membranous front fins that vibrate rapidly—may be witnessed almost any day on the trip from Los Angeles to Catalina Island. The first fossil of a flying fish occurs also, as well as the first flying reptile, in the Triassic period. The Triassic period was one of increasing aridity, which placed a premium on the ability to travel far and swiftly in search of food and water. As a consequence, certain reptiles learned to fly, and a large group of dinosaurs learned to run on two legs, just as today in arid regions modern lizards often tend to this mode of locomotion. An event of much greater importance that the development of the huge dinosaurs took place during the glacial period of Permian times, although the first records of it are not found until late in the Triassic period. The cold and aridity not only placed a premium on great speed of movement, but also on the ability to keep warm. Reptiles and fishes are very susceptible to cold. This in large measure is due to their imperfect blood circulation. The heart, unlike that of mammals and birds, has less than four chambers, and the oxygenated blood mixes with the impure blood before being sent to do its work throughout the body. Not only do the reptiles lack a pure blood stream, such as is present in the higher animals, but the heart is incompetent to keep the blood stream active enough to maintain a constant temperature in the body. When the surrounding environment is warm the reptile or fish becomes warm, and when it becomes cool the fish or reptile becomes correspondingly cool and sluggish. This is a great disadvantage in a period of cold weather, such as Permian times are known to have been. The desire for greater activity, and to keep the body at a constant temperature in the face of cold weather, enabled the psychokinetic power guided by extrasensory perception, and no doubt stimulated by favorable planetary energies, to use hormones and other factors to change the scales of certain reptiles into hair, and to develop that great advantage, a four-chambered heart. This change was taking place before the Triassic period. In the rocks of the Triassic period in South Africa fossils have been found of a group of reptiles known as Cynodonts, that had discarded the type of teeth characteristic of reptiles, and had developed teeth like those of the modern dog. They well bridge the structural gap between reptiles and mammals. In addition to the incentive for warm blood and warm clothing, brought by the cold of Permian times, in the Triassic period there was increasing aridity, placing a high premium on the ability to travel far for food and water in a short space of time. The more perfect circulation of both birds and mammals enables them not only to endure cold without hibernating, as reptiles do, but also conduces to greater activity. That the mammals, which seem to have developed from reptiles that traveled on four legs, remained small and inconspicuous creatures for a period almost twice as long as has elapsed since they became important forms of life upon the earth probably was largely due to the inner-plane weather at that time which, as well as outer-plane conditions, favored the dinosaurs. During this period there was an immense number of varied forms of both large and small carnivorous dinosaurs which preyed upon all other living creatures. Only small forms of mammals which could dart into shrubbery, or into burrows in the ground on a moment’s notice, could hope to survive the stalking terrors of that day; for no mammal that ever lived, with the exception of modern man armed with explosives, could have been successful in combat with them. It was only when the Age of Reptiles came to an end, and all these monsters mysteriously became extinct, that the mammals had a chance to become important creatures. The second period of the Mesozoic era, the Jurassic period, commenced about 155 million years ago. It ushered in a mild humid climate in which vegetation grew lush and rank in vast swampy lowlands. As a result of this abundant and easily obtained vegetable food supply, many of the dinosaurs that hitherto had been rapid travelers and many that had been creatures of prey, resorted to the swamps and the easier method of living upon a vegetable diet. They became indolent, living much of the time in the water, and less and less adapted to a strenuous life on land. This possibly contributed somewhat to their extinction at a later period when a severe climate set in once again. Many of the dinosaurs of the Triassic period ran on two legs, and food seeking and the desire to escape terrestrial enemies caused some of the smaller species to take to the trees. A dinosaur running swiftly over the ground on its hind legs would be helped immensely in its speed by using its arms as does a human runner, if these became broadened to resist the air on the backward swing. This desire for speed may have been somewhat instrumental in changing, through psychokinetic power, the fore limbs into wings. The species that went into the trees no doubt learned to perch there out of the way of predatory creatures below. They had, judging from their descendants, three long fingers provided with large claws which were used in climbing, even as a modern bird, the Hoactzin of British Guiana, still retains such claws on its wings for this purpose. The pursuit of their prey would lead them to jump rapidly from one limb to another, and if possible from one tree to another. 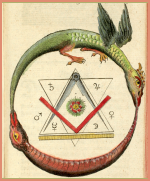 The desire thus to move rapidly through the trees without descending to the ground, which was full of peril, if intense enough would act upon the astral form of the creature and on the astral body of the offspring, modifying it in the attempt to find a method of accomplishing the sought for results. The scales of the reptile on both the fore limbs and on the rear limbs thus became modified to offer greater resistance to the air. 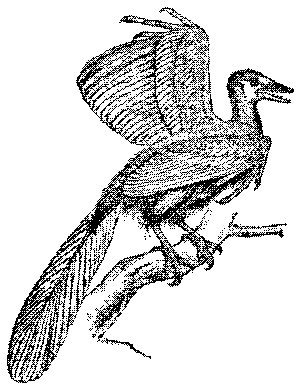 Probably the primitive bird used the hind limbs as well as the front ones for soaring; for in young birds such as squabs there are quills that sprout on the legs so arranged as to indicate that in the remote past their ancestors had steadying feathers on the legs as well as feathers on the wings. In present day birds these quills do not become feathers, but on some early fossil birds just such feathers are present. This development from reptile into bird seems to have taken place in the arid Triassic period, and as a result, early in the Jurassic period, which we are now considering, there may have been a four-winged bird, although no fossil remains of it have been discovered. The oldest bird fossils so far found were buried in the sedimentation laid down in the latter part of the Jurassic period, something like 135 million years ago. Two specimens of this bird have been found, both from a quarry at Solenhofen, Bavaria. This bird (page ) is known as the Archaeopteryx. The earliest fossil bird, it lived about 135 million years ago in the Upper Jurassic period. In many respects it is more of a reptile than a bird. It has teeth in both jaws. for instance. The bones of the hand have not yet fused into a modern wing, and although a wing is present, the fingers are yet armed with claws. The breast bone, which in modern birds must be very strong to support the Right muscles, is as vet quite feeble. In modern birds the tail is short and blunt and the feathers disposed about it fanwise; but this primitive bird has a long lizard-like tail, along either side of which the feathers are arranged in pairs. It appears in the fossil records long after the first record of a flying reptile. Unlike the primitive mammals, which lived by stealth and so in constant dread of the terrible reptiles that they had no chance to develop, the birds, well fitted to any extreme of temperature by their feathery covering—which in many respects is superior to hair or fur—seem to have undergone a steady progress from the very first. The third period of the Mesozoic era, the Comanchean, or Lower Cretaceous period, began about 120 million years ago. During this period the larger reptiles that had developed during the Jurassic period became extinct. The world was still replete with reptiles, but they were more specialized and the monsters had disappeared. This result may have been brought about by the change that took place in the vegetable world, although throughout most of the world the climate was still warm and much like that of the previous period. Nevertheless, in Eastern America the ferns, ginkgoes and cynads began to take a secondary place, and true flowering plants commenced to be the dominant form. The Comanchean period, therefore, may be called the period of the rise of flowering plants. The fourth and last period of the Mesozoic era, the Cretaceous period, commenced about 95 million years ago. The reptiles were smaller than previously, but were numerous and had reached the height of specialization. There were numerous queer forms, some of which were unbelievably grotesque. Toward the end of the period, great mountain chains rose, there was considerable climatic change, and the reptiles were not so diverse in development, many of the queer looking ones having vanished. Here, for the first time, are records of the first placental mammals—those that do not lay eggs—the marsupials, being primitive forms of the opossum and kangaroo. The records of this period are mostly marine, the chalks of Kansas producing the fossils of birds, as well as those of sharks, fishes, sea turtles, sea reptiles, and fish eating flying lizards. The birds of this period all retained the teeth of their reptilian ancestors. Two mounted skeletons of each of two birds from this period are preserved at Yale. One, Hesperornis, is a diving bird about four and one half feet long that, like our penguin, had lived so exclusively in the water that it had lost the power of flight, although small wings are present. The other is a bird much like our modern gull except that it still had teeth. Among the dinosaurs there were two divergent races. One race kept all four feet on the ground and developed into the present day crocodiles. The other race moved on two legs and developed into birds. But toward the end of the Cretaceous period extensive land areas were greatly elevated and all the innumerable dinosaurs, for some reason not well understood, became extinct. Whether it was the cold, small mammals that ate all their eggs, or some infectious disease with which they were confronted, they were unable to meet the new condition successfully. The mention of infectious disease brings up the question of the place of viruses in evolution. They give the appearance of being on the boundary line between organic and inorganic substance. When they appeared first on earth is not known. In fact, as they are invisible with the ordinary light microscope, little was known about them until 1941 when they were first made visible with the electron microscope. Some live on animals, some on plants, and some are bacteria eaters. Outside the bacterium these latter seem dead, but when they enter the bacterium they quickly come to life, multiply rapidly through sexual union after the manner of most protozoa, and when the colony thus generated numbers several hundred they burst forth through the ruptured walls of the bacterium.